The book deals with the propagation and absorption of high frequency waves in plasmas (hot, fully ionized gases). Research in this field is very active in controlled fusion research, i.e. the quest for energy from nuclear reactions similar to those going on within the sun, and in astrophysics, i.e. the study of space plasmas in the earth ionosphere, stars, and galaxies. 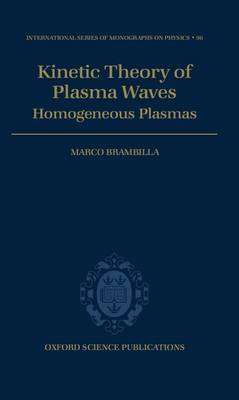 The text collects in a structured and self-contained way the basic knowledge on the broad and varied behaviour of plasma waves, adopting the microscopic kinetic description of the plasma as unifying principle. The internal coherence of the theory is explicity stressed, and very interesting physical phenomena peculiar to plasmas, such as collisionless damping of waves, the development of stochasticity in the interactions of charged particles with electromagnetic waves, and nonlinear interactions between waves, are discussed in detail. The most common and useful approximations used in solving practical problems are derived as special cases from the more general kinetic approach, thereby clarifying their meaning and domain of applicability. This exposition should be useful to plasma physicists both as an introduction and a reference to this field of research. Because of its multi-disciplinary aspects it might also be of interest to people specializing in kinetic theory, classical electromagnetism, or classical mechanics, as a nontrivial example of application of the methods of these fields to the unconventional plasma medium.